Yoga has been an impressive exercise regime which not only benefits the body but also the mind. There are all kinds of benefits that a person can avail by practicing various yoga posts. Yoga can certainly be done in a group setting along with a dynamic of many people who are indulged in stretching and exercising with you, and it adds a sense of unity as well as understanding to achieve a common goal of both improving flexibility as well as functional strength. Yoga can be extremely practical and beneficial to bodybuilding, and it can stimulate the growth of muscles in various part of the body. A lot of yoga poses for Weight Lifters are also theatrical as well as graceful. In case you are a weight lifter, then you must be familiar with the testing of your strength as well as endurance as your workout tends to build your muscle mass along with increasing cardiovascular endurance of your body. Yoga postures can also achieve these similar goals, and also bring the body into far better and greater balance by means of strengthening and lengthening the muscles which are generally tightened due to various weight-lifting routines. You can practice many yoga poses that help you as a weightlifter and make you stronger and also make your muscles flexible and more functional. 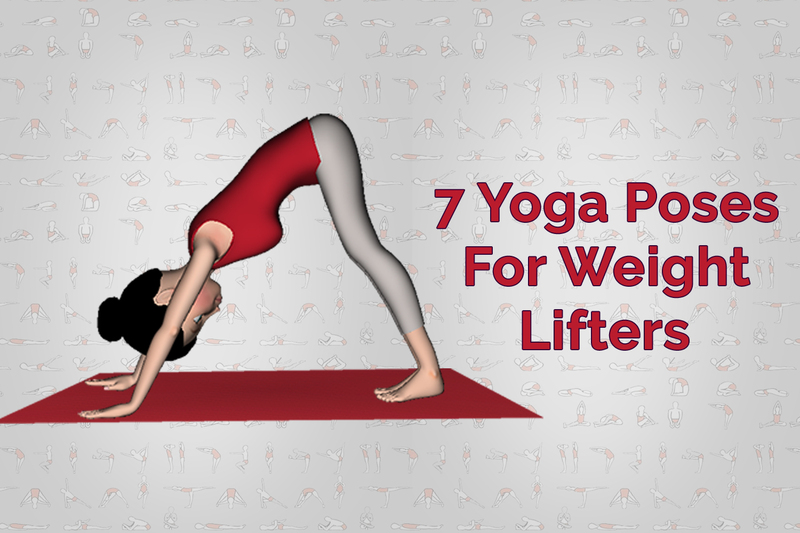 Mentioned below are few of the yoga poses which are meant for weightlifters that can be used by you in the rotation along with your regular exercising routine. This yoga pose will challenge your balance as well as improve your muscular strength to a greater height. In this particular pose, you need to support your weight on one particular hand, and the blade edge of the one foot as the core strength of your body works in keeping your hips from getting sagged. In order to achieve this particular pose, you need to recruit the core muscles and then feel your inherent ability to grow light as well as buoyant while keeping and holding up your own weight. You need to keep the outer edge of the grounded foot strong and then lift the top hip to a higher level in the air in order to create a feeling of lightness. The essential practice tip is that you need to move your wrist just a little bit forward from underneath the shoulder directly and then distribute the weight evenly through the complete surface of both your fingers as well as your hand. This particular pose is termed after a proud and fierce warrior mentioned in Hindu mythology, born from the hair lock of the Shiva, the ruler of the Universe. Some have translated this name as Vira, the hero, and Bhadra, the friend. In order to sustain this posture for nearly 4 to 5 breaths, you have to keep this notion in your mind. You have to fold forward from the hips until the chest is parallel to room’s floor and then you need to extend the left leg behind the body and then reach the arms forward in the opposite direction. This pose will also increase the heart rate of your body and also teach you about how to balance entire body’s weight on one leg, Extension via the arms as well as legs will also lengthen your thighs along with muscles of the upper arms. The key practice tip of virabhadrasana steps pose is that you need to keep an internal rotation in the legs of your as well as your hips need to stay in line with each other as you lift the back leg and the back knee should rotate towards the room’s floor rather than flare open towards the side of the room. This asana is called by this name as it resembles a dog who is stretching upwards. This asana is also considered to be the cousin of the yoga pose, Bhujangasana or the Cobra pose as it is essentially similar to it. These two backbends are considered to one of the easiest yoga backbends, and they are usually performed as one of the steps of Surya Namaskar. In this yoga pose, you have to do this stretch like a dog in order to counteract the muscles tightening which can occur in the chest muscles from an intense and rigorous weigh-lifting round. In this pose, you need to remember that you should focus on engaging the legs and then lift the front of the abdomen up and in, just like zipping up a pair of pants which are tight, in order to make sure that the weight is evenly distributed through the hands and also encourages the chest to stretch both forward and up. It is among one of the best yoga poses as it is an “arms balance asana” which is quite simple. The term Kakasana comes from the word Kak which mean Crow in Sanskrit while Asana which means posture. This asana is among the foundations of all the postures for arm balance. It requires considerable strength in both the arms as well as shoulders. This is the reason why this pose is not considered to be among the best yoga postures for the beginners. However, it doesn’t actually mean that the beginners shouldn’t do this pose. It just means that the person needs to have some level of physical fitness as he attempts this asana. It strengthens the arms’ muscles along with the core and also promotes the good form. For this reason, it is among the most commonly referred and recommended yoga postures which are genuinely interested in overall fitness. It is about balancing all the weight on the hands. In order to keep the things light and easy in this particular pose, the core must be solid as well as the gaze should move forward towards the front of the fingers. In case you look back at the feet, the weight of the head will bring you down. This pose cultivates both fearlessness as well as awareness of where the head of yours is in space. After you have worked the front as well as sides of the core along with the arms, hard with these different poses, it is now your turn to counter stretch in order to open these areas and also strengthen the backs of the lower legs as well as lower back. This pose can also be used to resolve the issue of tight muscles on the body front and also strengthen as well as tone the muscles which are supporting the hips and the lower back. Next time you think of switching things in your daily routine, then let yoga, as well as your body weight, guide you into challenging territory. This yoga pose’s name comes from the Sanskrit words adhas which means down, Mukha meaning the face, swana which means the dog and the asana which means the pose. It is similar to a dog looking down and bends. This asana has various great benefits which are quite important for you to try and practice on a daily basis. It is also easy for beginners who wish to get started with this asana with great ease. The key benefits of this asana are that it strengthens the upper body, shoulders, arms as well as chest and legs. It also stretches the chests and shoulders. It stretches the entire body back along with ankles, spine, hamstrings, and calves. These benefits make it an ideal yoga pose for weightlifters who are trying to stretch their body after a workout. It also calms the mind and energizes the entire body. It also stimulates the circulation of blood and also neutralizes the spine between the forward bends and backbends. Its name originates from words of Sanskrit, Kapota which means pigeon and asana which means posture. When one does this pose, it appears just as graceful as the bird is. With this asana, one can find more freedom as well as energy in the spine and the mind. It has a lot of benefits and also provides the body with a good stretch. It is quite good if you had a heavy leg day. It should be done before squats, deadlifts or any exercise which engages the glutes. It helps the weight lighters by stretching out the glute as well as the hip of the forward leg. It also stretches the psoas as well as lengthened leg’s hip. It increases the mobility in the legs. All these yoga poses are extremely beneficial for the weightlifters. They can be tried before doing the weightlifting and after the routine to both stretch and relax the muscles as well as building strength and flexibility of the muscles. They are quite beneficial to the overall body posture and can stimulate the growth and build the mass of the muscles.